Once, photojournalism and visual forms of documentation could be relied on as a noble, if not always unproblematic, way of testimony. Especially in the days before the internet and the mass availability of cellphone cameras, images had the power to wake the conscience. We know this because of iconic photographs such as Nick Út’s 1972 click of a young girl in a napalm attack, which would become emblematic of the Vietnam War and of chemical warfare. Images of malnourished children in the Ethiopian famine of the 1980s also moved people in the West to offer tangible monetary donations to help them. In India, Pablo Bartholomew’s photograph of a dead baby after the 1984 Bhopal gas tragedy made people all over the country understand its seriousness. Visual journalism has always helped us not just imagine, but to understand. So I am not sure why we – who now see images of pain on a daily basis – are less moved by them than we once were. There shouldn’t be a saturation point to empathy beyond which we become desensitised. This is not acceptable– especially not when taking positions of active denial. In interpersonal relationships, the term “gaslighting” is used when a person’s reality is manipulated through another’s outright refusal to acknowledge it. For instance, one sibling telling another, “Our parents were not abusive; you’re making it up”. Or a spouse who says “It’s not inappropriate for me to go on holiday with my ex; you’re delusional”. We see that gaslighting now continuously where narratives of mass suffering or fear are concerned. When Myanmar’s extremely well-spoken Aung San Suu Kyi tells a BBC interviewer that there is no genocide and we nod our heads and decide to accept her propaganda, complete with captions about the “TRUTH!”. As for footage of Rohingya people wailing, fleeing, begging to be killed rather than to be deported – telling their own stories – we decide that they must be lying. We decide they must be setting fire to their own homes. We decide they must be killing their own children. We watch a video of a man carrying his mother on his back for four days and we call it a political stunt. We watch a video of a child carrying her baby brother on her back, their dead parents miles and miles behind them and say she was bribed into crocodile tears. We scroll past the video after that. We decide they are not like us, because we decide first of all that we are not like them. And that’s where all such crises begin. In times like these, I’m not interested in which “side” started a conflict, or who allowed it to fester. The distance of analysis like that belongs either to less empathic people or to a later time. Is it or is it not a genocide? It will be before long. Experts will count the numbers later and say “oh yeah, it was” – but today, right now, is when those numbers are being racked up. Maybe we as individuals can do little of real value to assist. But it should not be so easy for us to tear our eyes away. An edited version appeared in The New Indian Express on September 14th 2017. “The Venus Flytrap” appears on Thursdays in Chennai’s City Express supplement. 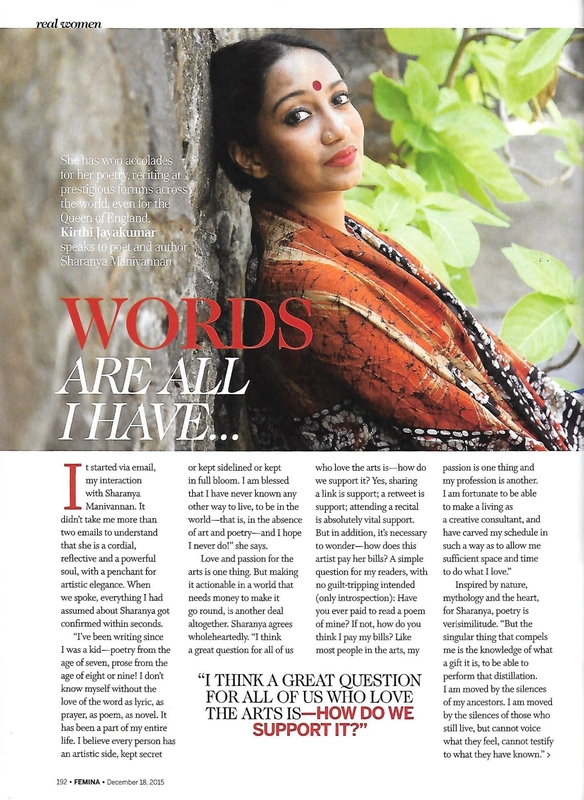 I was very thoughtfully interviewed by Kirthi Jayakumar earlier in 2015 for Femina. The piece appeared in the Dec 18 2015 issue of the magazine. I’m still thrilled about the publication of my short story, ‘Sweet’, in the brand new The Affair magazine. Here is an interview about the story, the sense of place in my work, and more. I was recently interviewed on creativity and inspiration for A Learning A Day’s Real Leaders Project. Check out the video here. 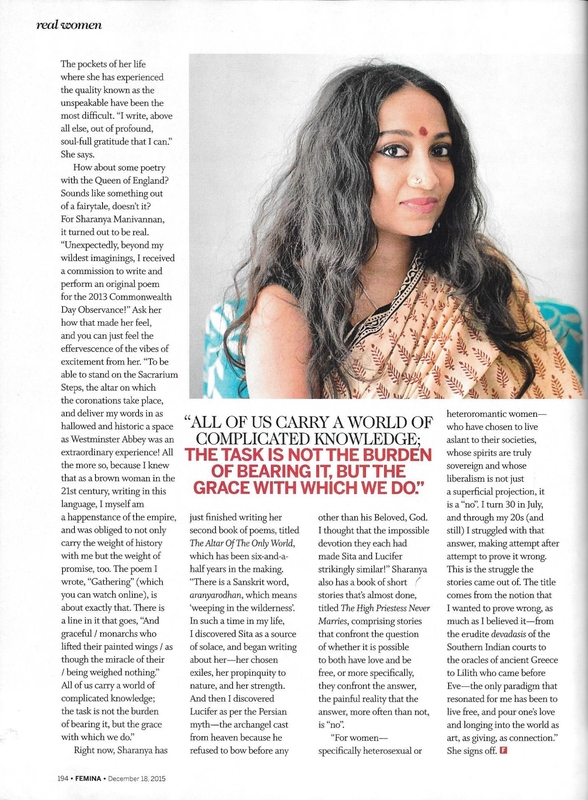 An interview in The Observer, a publication from the Indian Institute of Journalism and New Media, Bangalore. A profile in the Sri Lankan newspaper Sunday Observer. Read it here. 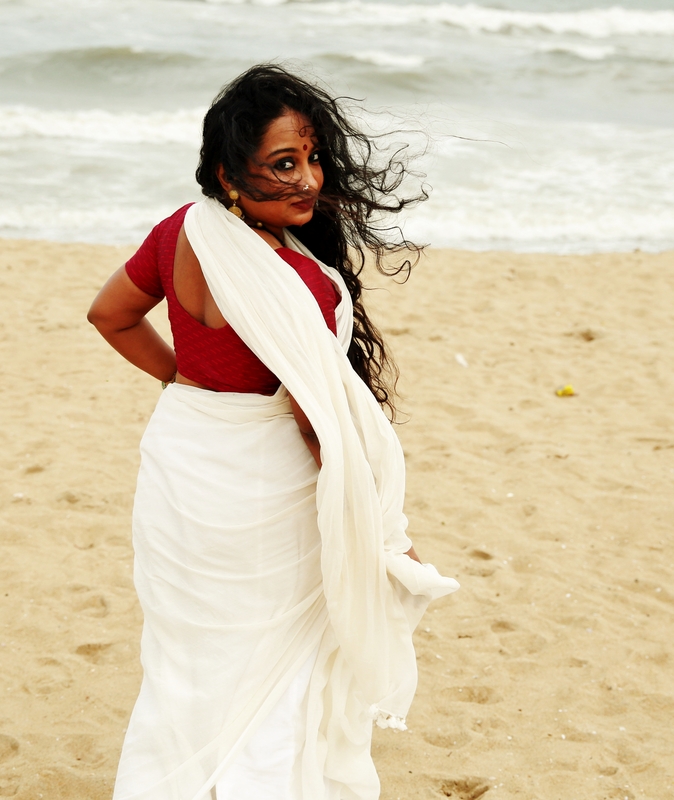 The Kerala editions of The New Indian Express carried this article about my work today.